Our mountain home sits at nearly 8500 feet centered between Angel Fire Resort's beautiful Championship PGA 18-Hole Golf Course and the Resort's private trout-filled Monte Verde Lake. The views from the two large rear decks of the surrounding mountains and countryside are amazing. Located approximately two miles to the Town Center, the Resort's ski base can be easily accessed from your own vehicle. Our three-story floor plan has over 1600 square feet and is designed to comfortably sleep 12 people on real beds. The kitchen contains all the needed appliances. The living room/dining room is an open concept with a soaring wood ceiling, a very nice gas fireplace, 32" TV and lots of glass to take in the wonderful views. There are two full baths. The tiled entry room is large enough to keep your ski equipment inside or can be used for an additional dining area if you want to use the folding table and chairs that are available to you. We have a nice utility room with front loading washer and dryer. Our family purchased this beautiful mountain home in June of 2015. 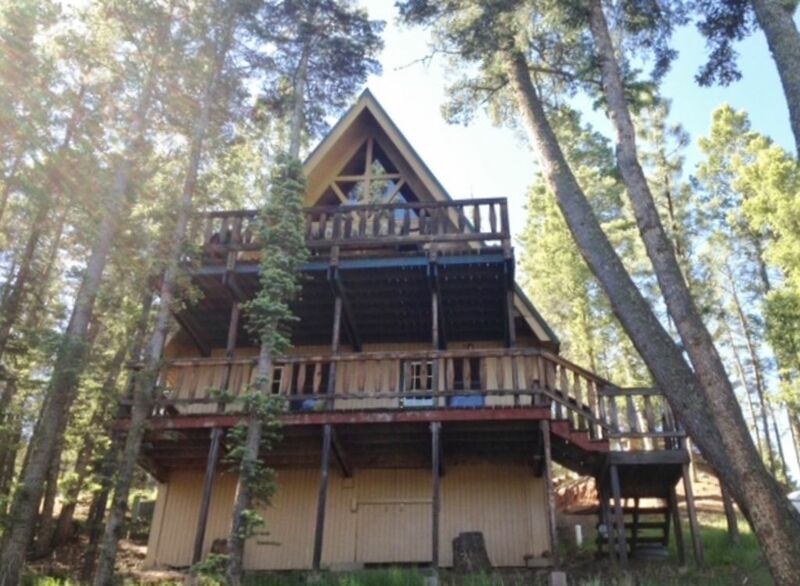 We are super excited to share this lovely cabin with guests as a vacation rental. We love our family time at the cabin and the Angel Fire area. We think you will too! The treetop views from the back deck of this cabin are breathtaking. It is very peaceful and relaxing here. It is an easy walk to Monte Verde Lake and the Angel Fire Country Club for summer activities and a very short drive to the ski lifts in the winter. It is not unusual to observe deer on the property while enjoying the vast mountain views from the upper or lower back deck. The view from the two back decks is stunning. Parking for two vehicles in parking spaces provided. May park off of roadway as well. Located at Angel Fire Country Club a short distance from the cabin. Dining table seats six. Kitchen Bar seats two. Total seating for meals is eight. Angel Fire Country Club, which is located a very short drive away, has an indoor swimming pool. Three families from our church stayed here over the weekend. Nice place to stay, descriptions in other reviews were accurate and the cabin was a nice place to stay, great location, and the snow was great for skiing this weekend! Thank you so much for choosing to stay at our cabin. We are glad that you found it comfortable for your visit. Hope you made many happy memories while vacationing in Angel Fire. We got what we expected, plus more. Start off with, parking is very small, but manageable. Property is on the side of a slope so not really a flat play/hangout area outdoors, except the parking area. Kitchen is on the small side for multiple families, but possible and has everything you need. bathroom is next to living area. Back of house is the living room with high vaulted ceiling. Back deck offers great views and a grill to cook on. Third floor is the nook with 2 queen beds. A spiral staircase connects all floors in the center of the house. Bottom floor offers king bedroom, a kids room containing bunks and a full elevated bed, quiet cute. Washing maching/drier has a room down there along with a room bathroom. Both bedrooms have a connecting patio. This was a great find and served our purposes fine. Would have no problem staying again. We really enjoyed our stayed here and the owners were very sweet and easy to reach. I would definitely recommended this place. Property was exactly as-described. Great location--close to hiking, Monte Verde lake, and Golf Course. Easy to access. Views from the back balcony were great. House was nicely stocked with extras. Plenty of room, Clean, Cute, Private. Was perfect for our multi generational family get away. There was even a lovely Doe who slumbered in the yard just outside the cabin. Would totally come back. Perfect for party of 10! This property was great, everything we needed - well stocked. Only one mile (4min drive/20 min walk) from Monte Verde Lake. One downside is parking - only two designated spaces. Other than that this was a great house for a great price! We'd definitely go back!